We are super excited to be returning to one of our hometown’s best events, Three Rivers Arts Fest in the Artists Market. Come see the nation’s best artists, live FREE music, tons of cultural events and lots and lots of free, fun family-friendly activities. Heck, we even see lots of dogs there every year too, hooray! Our session starts on Wednesday June 11 and runs through Sunday June 15, 2014. So come see us at Booth #79 on Gateway Plaza every day from 12 noon – 8pm. And, we’re thrilled to announce that we did the Festival Identity this year too, so if you like what you see, let us know! Plus we designed a special, limited edition hand screen printed poster available exclusively from the Three Rivers Arts Fest Merch Booth too this year. We will have all of our hand silkscreen printed Art Prints, Rock Posters, Alphabet Prints and more, including one-of-a-kind Test Prints and recycled cotton Lunch Bags too. Below is a map of the Gateway Center Section with a handy map to our booth. 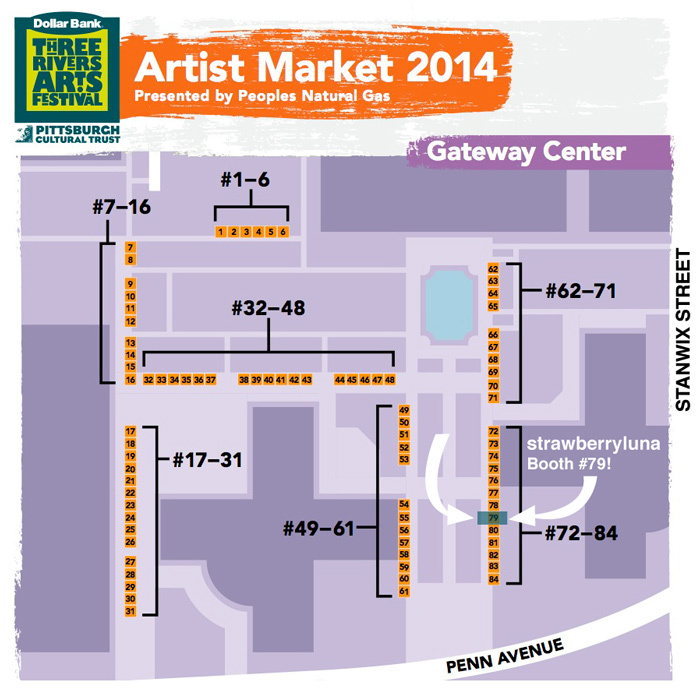 Click below to see the full Artists Markets Map. Yep! Hope to see yinz there! What: Three Rivers Arts Fest, silly! When: June 6-15, 2014 12pm – 8pm daily!